Excellent work on the cockpit. The wheels are just amazing. As I said...there isnÂ´t the right helmet / oxygen mask combination in the Tamiya kits for the 1988 version. So I used the HGU-55 helmet from the Block 50 kit and removed the MBU-20 oxygen mask. Next step was to remove the MBU-12 from the T-Bird kit and install it to the HGU-55 helmet of the Block 50 pilot. 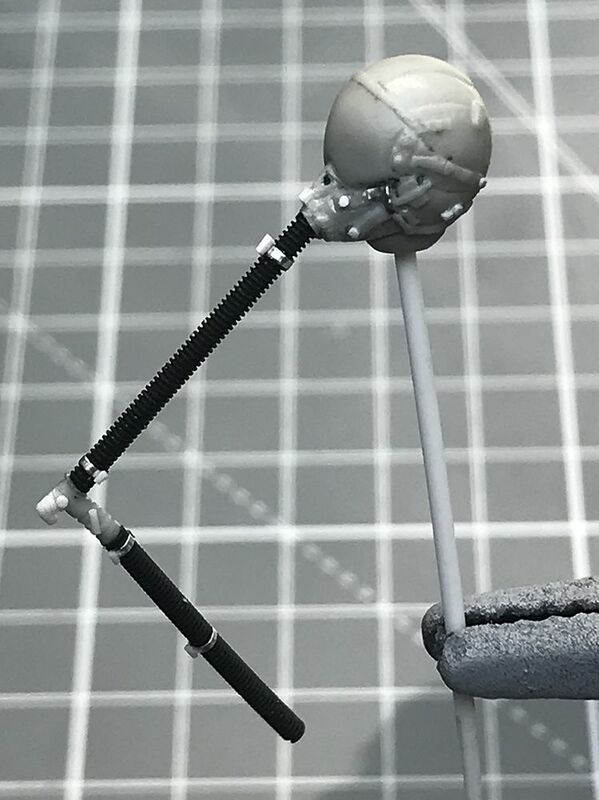 I added some details including an scratchbuild CRU-60 oxygen mask connector and a new oxygen hose. Now he is ready for some paint. Thank you. Yes, that wheels are awesome and I couldn`t do that model without my friends help with that wheels. Btw I love Vipers with the big external fuel tanks under the Wings. But for this Viper model, I will use only the Centerline tank in order to get a good view onto that wheels. What I wouldn't give for a set of those wheels! Kai, that is a great start to a great project. I like the cockpit details and the buttons that you punched out look really good. Your pilot figure is excellent, very authentic and good paintwork. I don't know what the standard issue was for uniforms, but have you considered a white t-shirt for the pilot? The splash of colour around the neck might provide a nice contrast? Wow, Kai! I'm happy to see you building again. I've seen some pics of your Viper progress on Facebook, but it's great to see them here with more and bigger pics. Thank you. That shirt issue was part of my research during the last few days. Because I wanted to do another colour for that shirt. But I couldn`t find any images of RS pilots with anything else than green or olive shirts. I was thinking it was part of the uniform rules at that time. 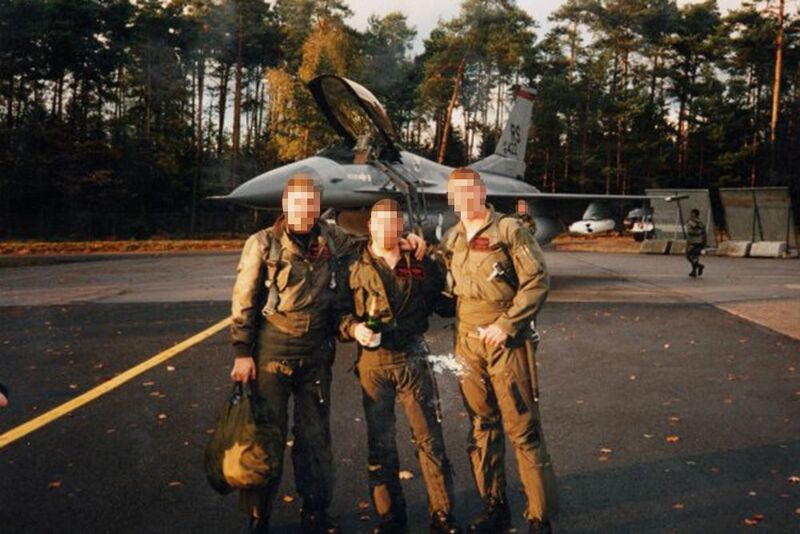 But I got in touch with an former 526th guy and he gave that image of three 526th pilots in front of F-16C 85-1422. In that picture you can see black and white shirts under the flightsuit. So...yes, I will change the colour of that shirt. Thanks my friend. It is always good to have a Viper-pro like you watching that topic. On this date, but seven years ago, we flew together to the J.C. Stennis . Great Scott the cockpit looks incredible! And the wheels are beautiful! Lovely build so far Kai - great too see such a cracking pilot coming together to go with all the top drawer cockpit and wheel details. Fantastic work, and great idea to add depth to the Eduard panels in the cockpit. I also really like your weathering. Thanks for sharing your build! Thank you Torben, Marcel, Shawn and Tom. Yesterday I painted the helmet. But...no...I am not happy with it. Does anyone have a good match for the HGU grey and the dark grey leather covers on the side? Usually I am using Gunze or Tamiya paint but I am open to any other paint for that helmet. Any help would be great.